Worm is a common name for any of a diverse group of invertebrate animals with a flexible, soft, typically long and slender body and generally without obvious appendages. 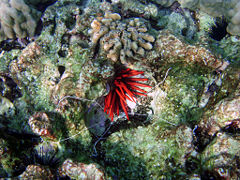 The term worm is not a formal taxonomic rank, but rather is the common name used for hundreds of thousands of species spanning numerous taxonomic groups, including species of annelids (Annelida), nematodes or roundworms (Nematoda), flatworms (Platyhelminthes), ribbon worms (Nemertea), spiny-headed worms (Acanthocephala), and diverse other phyla. About 2,700 of the invertebrates known as worms are earthworms. In addition, the term is used for the larva of various insects, such as grubs, which have a soft, elongated body. In addition to land animals, many marine and freshwater species, which are usually seen only by professional biologists, are recognized as "worms." In the medical field, the term worms generally refers to parasitic, soft-bodied organisms, such as trematodes (flukes), cestodes (tapeworms,) and nematodes (roundworms), that infect human beings and animals, and in particular parasites of the intestines. 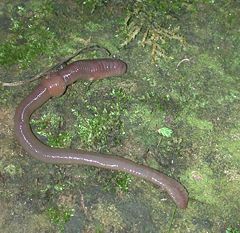 In some cases, the term worms also is applied to some vertebrate species (creatures with a backbone) such as blindworms and caecilians. Worms play a vital ecological role. They are a vital link in food chains in virtually all the ecosystems of the world, and many species of worms are decomposers, helping to break down dead plants and animals to return nutrients to the soil. Earthworms aerate and mix the soil, help with composting (converting dead organic matter into rich humus), and convert soil particles into accessible nutrients. Polychaetes, because of their abundance in marine environments, are an important food source in the oceans for fishes, birds, and other invertebrates, and those that part of the benthos help in the recycling of organic matter. There are other values for humans. The leech, for example, can be used medically in controlling swelling, as it produces chemicals that can serve as an anesthetic and prevent blood coagulation. Other worms are used as bait for recreational fishing and as indicators for monitoring the health of environments. The striking colors, iridescent forms, and unique shapes of some species add greatly to the wonder of nature. Metaphorically, worms are used as a metaphor of putrefaction, death taking over life, and death itself, an image of hell. There exists a mythological image of a never dying worm who is eternally eating dead people (Ligeia). Animals grouped as worms usually have a cylindrical, flattened, or leaf-like body shape and are often without any true limbs or appendages. Instead, they may have bristles or fins that help them move. Many worms have sense organs that can detect environmental change. A few may even have light-sensing organs. Worms vary in size from less than 1 millimeter (0.04 inch) in certain aschelminths to more than 30 meters (100 feet) in certain ribbon worms. Some worms reproduce sexually. Most polychaete worms have separate males and females and external fertilization. Hermaphroditism, the condition in which a single individual possesses both male and female reproductive parts, is common in many groups of worms. Earthworms are hermaphrodites but generally cannot fertilize their own eggs. Asexual reproduction, whereby new individuals develop from the body cells of another, also occurs in some worms. Asexual reproduction by fission is a method used by some annelids and allows them to reproduce quickly. The posterior part of the body breaks off and forms a new individual. Some earthworms have the facility to replace or replicate lost segments, including some that can regenerate a new head. Worm species differ in their abilities to move about on their own. Many species have bodies with no major muscles, and cannot move on their own—they must be moved by forces or other animals in their environment. Many other species have bodies with major muscles and can move on their own; they are a type of muscular hydrostat. Worms live in almost all parts of the world including marine, freshwater, and terrestrial habitats, as well as brackish and arboreal environments and the seashore. There are hundreds of thousands of species that live in a wide variety of habitats other than soil. The worms may be pelagic, surface dwelling, or benthic, burrowers or tube dwellers, mobile or sessile. Arrow worms (Chaetognatha) are a major component of zooplankton worldwide. 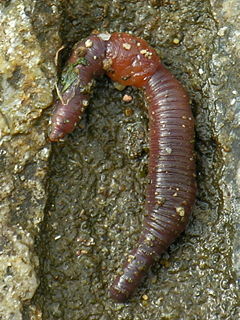 Many worms thrive as parasites of plants (for example, aschelminths) and animals, including humans (for example, platyhelminths, aschelminths). Several other worms may be free-living, or nonparasitic. These may include raptorial forms (carnivorous, herbivorous, omnivorous, scavenger), deposit feeders, filter feeders, and suspension feeders. 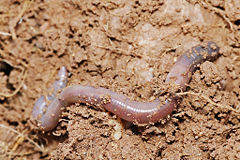 Some worms living in the ground help to condition the soil (such as annelids, aschelminths). In everyday language, the term worm is widely applied to numerous living forms, including flatworms, annelids (including earthworms and leeches), ribbon worms, spiny-headed worms, nematodes, larvae, insects, centipedes, and shipworms (teredo worms). There are three main groups whose members largely are known as worms. Flatworms. The first of these includes the flatworms. This phylum is called Platyhelminthes. They are simple, soft-bodied, bilaterially symmetrical, invertebrate animals. Typically, they have a flat, ribbon- or leaf-shaped body with a pair of eyes at the front. Some are parasites. The name of the phylum comes from the Greek platy, meaning "flat," and helminth, meaning "worm," which is indicative of their ribbon-shaped, flattened appearance. They include the flukes and tapeworms, among others. Nematodes. The second group contains the threadworms, roundworms, and hookworms, among others. This phylum is called Nematoda. Nematoda is one of the most common phyla of animals, with over 20,000 different described species, found in freshwater, marine, and terrestrial environments. They have bodies that are long and slender and taper at both ends. 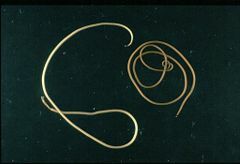 Threadworms may be microscopic, such as the vinegar eelworm, or more than 1 meter (3 feet) long. They are found in damp earth, moss, decaying substances, fresh water, or salt water. There are a great many parasitic forms of nematodes, including pathogens in most plants and animals. The Guinea worm, for example, gets under the skin of the feet and legs of people living in tropical countries. Annelids. The third group consists of the segmented worms, with bodies divided into true segments, or rings. This phylum is called Annelida. The three major groups of annelids are the polychaetes (largely marine annelids, with over 5,500 species); the oligochaetes (earthworms and freshwater worms, with over 3,000 species); and the hirundinea (leeches, with about 500 species). Leeches typically are characterized by a small sucker on the anterior (mouth) end of the cylindrical or somewhat dorso-ventrally flattened body, and a larger sucker on the posterior end. The most common worm is the earthworm, a member of phylum Annelida. Earthworms in general have been around for 120 million years, evolving during the time of the dinosaurs. They enrich and aerate the soil; Charles Darwin found that worms turn over the top six inches (15 cm) of topsoil every 20 years. They lack a brain but have nerve centers (called ganglia); they also lack eyes but can sense light with photoreceptors. Arrow worms comprise the phylum Chaetognatha and generally are characterized by a largely transparent, bilaterally symmetrical, soft-bodied body, fins on both the tail and the body, and grasping bristles or hooks on each side of the mouth that are used to capture prey. They are generally less than an inch (2.5 centimeters) in size. Other invertebrate groups may be called worms, especially colloquially. In particular, many unrelated insect larvae are called "worms," such as the railroad worm, woodworm, glowworm, bloodworm, inchworm, mealworm, or silkworm. Worms may also be called helminths, particularly in medical terminology when referring to parasitic worms, especially the Nematoda (roundworms) and Cestoda (tapeworms). Hence, "helminthology" is the study of parasitic worms. When an animal, such as a dog, is said to "have worms," it means that it is infested with parasitic worms, typically roundworms or tapeworms. "Ringworm" is not a worm at all, but a skin fungus. Rowland, B., and R. J. Frey. 2005. Worms. In J. L. Longe, The Gale Encyclopedia of Alternative Medicine. Farmington Hills, Mich: Thomson/Gale. ISBN 0787693960. Shewell-Cooper, W. E. 1975. Soil, Humus and Health: An Organic Guide. Newton Abbot, England: David and Charles. ISBN 0715366289. This page was last modified on 17 October 2008, at 05:35.